“Extraterrestrial and the Holy Crusade,” Jessica Estevan's most recent series, is based 400 years in the past. It references history—twisting conspiracies, real events and locations. The series explores the question: if aliens were “associated” with Spain’s search for gold, how would these extraterrestrials have affected The Conquistadors’ invasion of what is present day New Mexico? Despite its cultural and visual wealth, New Mexico has historically faced a lot of setbacks. The history of its distinct cultures has remained controversial for over 400 years. Its history begins in Spain. By the late 1400’s, centuries of war in Europe had finally ceased. Spain had reclaimed the Moors’ rule and the enlightenment of Christianity had inspired their next motif—God, Glory, and Gold. This Holy Crusade would deny the colonization of most of South America, Mexico and the Southwestern United States. Both the Mayan and Aztec civilizations were rich in gold, adorning their temples and mining the gold which was a part of their everyday lives. Spain’s conquest nearly stripped all of their resources. Traditions, religions, beliefs and pride were taken away, as ancient ways of life were quickly replaced by the codes of Christianity. By the time Conquistadors had made it to Northern Mexico (Southwestern United States today), they had overtaken numerous tribes. Native Americans lost their freedom and identity in the same manner as the Aztecs and the Mayans. “Ceremonies at Chaco: 1050 A.D.” is based off of Chaco Canyon, NM, once home to the Anasazi, one of the oldest recorded civilizations in North America, before they disappeared around 1050. “The Abduction of Battleship Rock: 1541 A.D.” illustrates a landmark in Jemez Springs, NM. By 1541, the Spanish had settled in Jemez Pueblo, surrounded by mountains that were the source of several rumors regarding odd incidents. This painting illustrates Conquistadors and horses ascending in bright lights, losing themselves; their individuality, much like the cultures they had conquered. “The Taking of San Miguel Mission: Pre- Pueblo Revolt 1680 A.D.,” is a commentary on religion forced upon ancient beliefs. The Holy Crusade instigated several missions, and one of the oldest Catholic churches in the United States is the San Miguel Mission in Santa Fe. This city was once the central point for Spanish settlers, where many of New Mexico’s Northern tribes were forbidden to practice their old traditions. The “Extraterrestrial and the Holy Crusade” series addresses a lighter side of a controversial history. Though there are bright colors and ludicrous compositions, the dates and locations in the titles are crucial to times of ceremony, or times of invasion—whether the invaders were settlers, or aliens. Jessica Estevan is an artist from Northern New Mexico, currently based out of Albuquerque. Jessica received her B. F. A. at Oregon College of Art and Craft in Portland. This allowed her to see culture(s) from outside of the Southwest lens - a space where Jessica could better understand the richness of her home state. Her small town upbringing surrounded by high desert lifestyle has become the underlying foundation of her artistic inspiration. She hopes to communicate her upbringing and experiences through painting compositions of nostalgia and the colorful importance of her cultural ancestry. 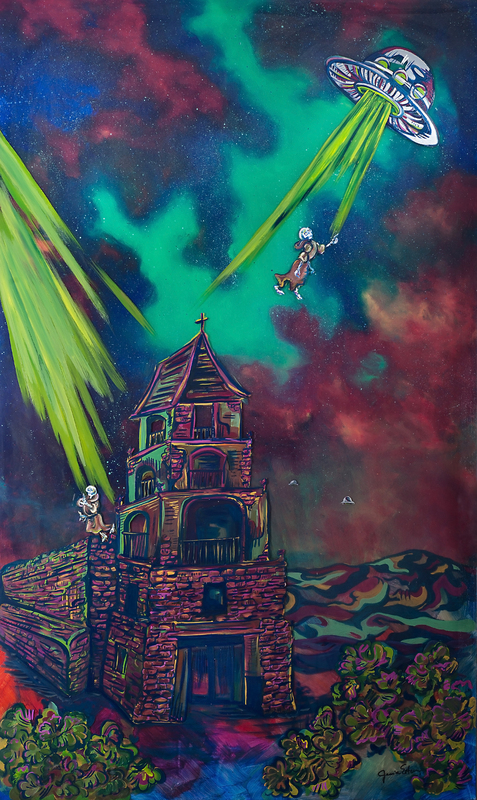 This series is whimsical, enticing you with vivid galaxies and peculiar space ships abducting the Conquistadors. Each painting’s title references a date relevant to the times and locations where the Spanish had once settled.